The week both began and ended in spectacular style for the St Helens Striders as Paul Booth became an Iron Man and over 30 members completed the Conti Thunder Run. 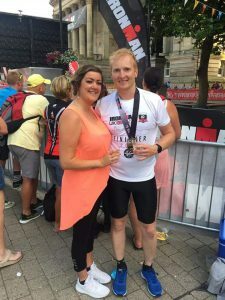 After months of following an intensive and highly scientific training plan, Strider Paul Booth competed in Bolton’s Iron Man event. Widely renowned as one of the toughest Iron Man events in the world , the course is extremely hilly yet Paul was able to complete a 2.4 mile open water swim, a 95 mile bike ride followed by a whole marathon in under 12 hours. Paul was supported by a band of fellow Striders and proud girlfriend Nicola who admitted she was most relieved when he finished the swim as several competitors had to drop out of the race at this point. Paul’s dedication to the cause is such that when he needed to do a run but was looking after his young daughter Rosie, he literally ran a half-marathon by going back and forth doing laps of his back garden! This is an extreme event so to even finish, let alone achieve a time of under 12 hours is phenomenal. The week finished with the Conti 24 hour Thunder Run. 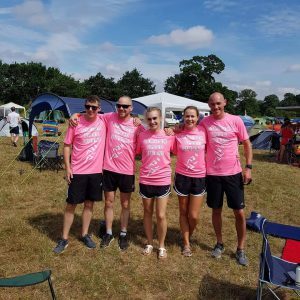 The idea of which is that teams of runners take part in a gruelling 24 hour relay where one member completes a 10km loop then passes the baton over to another team mate which continues over a 24 hour period. The course is a highly technical trail course with treacherous paths and steep hills throughout. This made running throughout the night in particular a nerve-wracking, sleep-depriving yet exhilarating experience. All teams produced some absolutely stand out performances with members completing an average 3-5 laps each. That’s 30-50km each in a 24 hours period with virtually no sleep. Team Speed Queens (Daniel Cheetham, Emma Callery, David Wilson, Anthony Ellis and Lisa Cheers) finished the event in 15th place after completing a staggering 26 laps with Cheetham completing 6 laps (60km equalling the club record for this event). Paul Brown showed true grit by carrying on to complete a 5th lap after the point teams that were allowed to finish. Member David Brisco described this event as his toughest challenge yet – a sentiment echoed by the majority of the Striders who took part. In other events, Jon-Jo Doherty, who also completed 5 laps at Thunder Run, equalled the club’s 5km record in an astonishingly fast time of 16:36 on Friday night at the Lancaster 5km event. 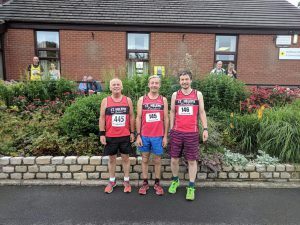 Members competed in the Elswick 10 miler with Chris Reid placing as 1st veteran 55 in an impressive time of 55 minutes. He was followed to the finish by Les Abbott and Alex Abbott to achieve a team prize. 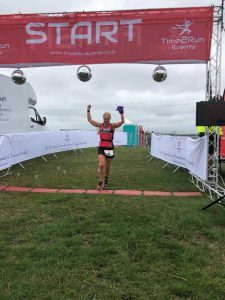 Finally this week, in between the excitement of Iron Man and Thunder Run, new member Colette Flaherty has been quietly completing 7 marathons in 7 days as part of the Scorcher Run festival – that’s an incredible 184 miles in one week. An outstanding achievement especially as she finished in third place overall and 3rd female. This represents determination at its best and finished off a week of extreme challenges for our members.